There is a huge need to have a sensible approach to cleaning, disinfecting and sanitising; killing 100% of bacteria 100% of the time is having an adverse effect on the human body and our environment. 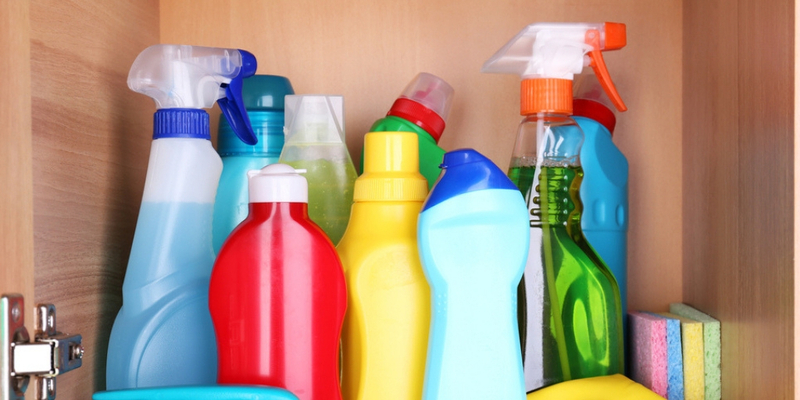 Chances are the cleaning cupboard in your home or business looks a little bit like this one; crammed full of different disinfectant, cleaners and sprays? if not, I am sure you can relate to the vast number of products that are available today. The market value of home care products has risen from £3,557 million to £4,103 million in the last 5 years; this is due to the increased awareness surrounding hygiene and disease control resulting in a greater demand from consumers. The list goes on but why do we need so many disinfectants? However, with all these strong bacteria killing products are we ridding our homes and our environment of important bacteria unnecessarily? A lot of products these days are ‘multi-function’ meaning; they clean stains and kill germs leaving the surface or object ‘bacteria free’. 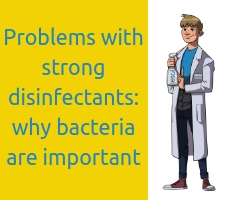 The main attraction of strong disinfectant is convenience, but there is a price to pay; killing all bacteria has an adverse effect on humans and the environment. Are we, all too quickly, reaching for a product that kills 99.999% of bacteria when there are safer, kinder approaches? Bacteria are mostly thought of in the context of disease, but without them we would not survive. Bacteria exist on and in our bodies, on our pets, on all surfaces, in the air we breathe and the food we eat; they are everywhere. There are conflicting views on how many bacteria live in the human body with some scientists reporting that microbes out number human cells 10 – 1. Whilst others state that the human body may be made up of roughly, equal numbers of body cells and microbes. Not all bacteria are bad; yes, there are certain harmful bacteria we do not want around which is why we diligently clean our kitchens and bathrooms. However our digestive systems have trillions of beneficial bacteria which live in our gut. Every person has his or her own specific community of bacteria essential to that individual. There are trillions of these bacteria which are categorised into different groups or ‘families’. They are essential for us to survive, protecting us from different illnesses and a wide range of health problems. Without these bacteria we would have no immune system and we would not survive. It is imperative to protect these bacteria, feed them with essential nutrients and they will do their best to protect us. This includes being very careful with the chemicals we use. Certain chemicals kill off these important, helpful bacteria for life which in turn weakens our immune systems and damages our health. Being very aware of our use of antibiotics and disinfectant can reduce unnecessary bacteria elimination. How can I make sure I am protecting my good bacteria? Is there a kinder alternative? What ingredients are in this disinfectant? Think about all the objects and surfaces around your home or business that are cleaned with an anti-bacterial cleaner or bleach – is it necessary? Could you swap some of your powerful disinfectants to a safer, healthier more sustainable alternative?